Good Morning! This is one of those types of cards that are my favorite to make, you know....the kind with lots of stamping. I love the way this turned out and I will certainly be making a few more of these. I made this card for yesterday's featured stamper challenge on splitcoast stampers. 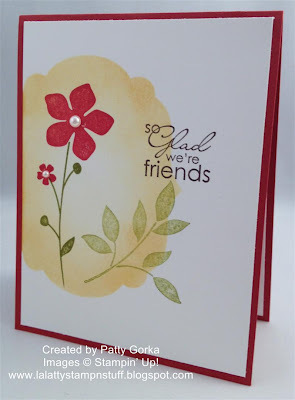 The featured stamp this week is naturecoastcrafter and this is her card that I decided to case. Congrats to you Jean for being this week's featured stamper! I loved the card that Jean made so I wanted to try and keep the same basic layout and stamp arrangement. I ended up using different, but similar stamps and I loved the colors she used, but I decided to add riding hood red for my flowers and card base. I began making my card by first cutting out my mask. In other words I cut out a label die and I used the reverse part of that cut out for my template for my masking/sponging. I placed that over top of my card base and I began my sponging. I sponged darker around the edges and lighter towards the center. Once my sponging was finished I began stamping my images- this is the fun part! Simply stamp away! For my embellishment I decided to add a basic pearl in the center of the two flowers. I decided to go ahead and make a video of my card using the reverse masking technique. I hope you like it! Thanks for stopping by and have a great rest of the day! Very neat idea Patty!!!. Great tutorial!!! Fun, Patty! You always come up with the best ideas.